I always want to call this book “Careless Whisper” like the Wham song. 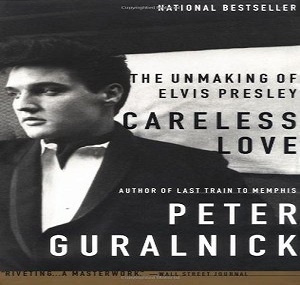 I first read Careless Love: the unmaking of elvis presley by Peter Guralnick when it first came out almost 20 years ago and hadn’t read it since. My copy is a paperback, but it is a first edition paperback. It had occurred to me before, but seeing it in print over and over again really drove home that so many significant events in Elvis’ life took place in August. Obviously his death and his mother’s death. Cilla moved to Germany Aug 15, the International Hotel opening in Vegas was in August and following engagements every August, Elvis and Anita broke up in August, news of Elvis and Ann-Margret broke in August, the Beatles visited Elvis August 27, Kathy Westmoreland joined the group August 16, 1970, Elvis met Jo Kathy in August and it seemed many tours began on August 16th. There were many things I didn’t know or didn’t remember. Elisabeth Mansfield was a bigger deal than is talked about – her relationship with Elvis was longer and more important than I thought. I didn’t know Patsy dated Sonny in 1960. Elvis dated Sandy Ferra longer than I thought. I did not realize Elvis actually dated Christina Crawford (Joan Crawford’s “Mommie Dearest” daughter) during Wild in the Country. She was the one Elvis dragged out by her hair when she objected to Joe lighting Elvis’ cigarette. 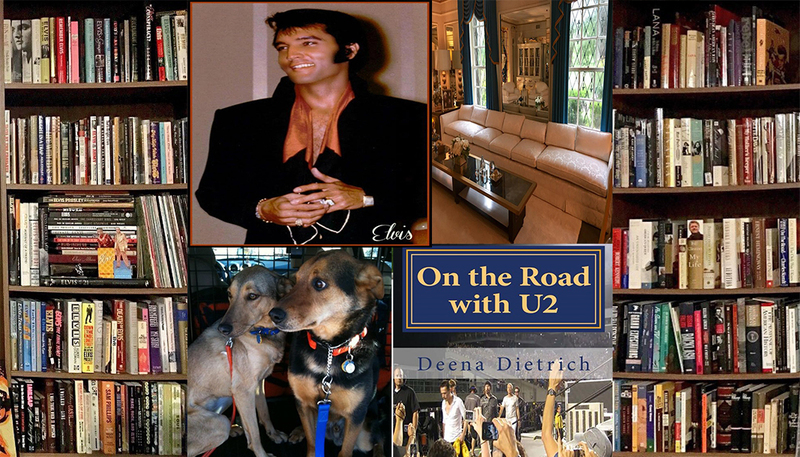 One of Elvis’ favorite books The Impersonal Life was published by Sun Publishing Company – coincidence or fate? I had no idea Elvis actually applied to be a police officer when he was 19, but was turned down because he was too young. Joyce Bova’s memoir was correct – she was a bigger deal than I thought. Had she not had an abortion, we would have another Lisa Marie or Elvis Jr running around. I love this quote Elvis said to Jerry Schilling, “You know, one of the most important things to learn in life is to be able to cope with not having anything to do.” I love it because I think that was Elvis’ main problem coping with having nothing to do (it was at the root of all his problems), and I also love it because I love to be alone with nothing to do and by nothing I mean just reading or watching movies or being with my dogs. And speaking of quotes. 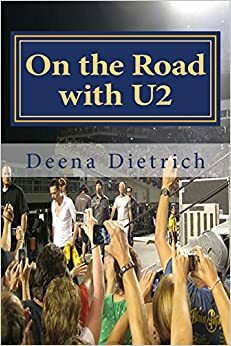 The famous quote is that John Lennon said, “Before Elvis there was nothing.” But Guralnick writes Jerry Schilling said that Lennon told him to tell Elvis, “if it hadn’t been for him I would have been nothing.” So is that where the quote came from, because that is a totally different meaning. I find it ironic and maybe a little sad that Elvis built the Meditation Garden to be alone and think and now millions spend time there to be with him. It’s no wonder I love the living room and foyer at Graceland and feel Elvis so much in that space. Elvis’ casket for his funeral was placed in the archway between the living room and music room, and I always knew that. But I had forgotten, or not realized, his casket was in the foyer under the chandelier for the fans viewing. Guess this is why I literally spend hours standing there while tours pass me by. If Elvis hadn’t gone into the army, would his career had been different? I think the army directly affected Elvis’ movie career and his movie career directly affected his performing and recording career. The first four movies Elvis made before the army were fairly serious acting roles and had actual plots. Then Elvis’ first movie after the army was the cheesy musical GI Blues, then he did two serious ones (Flaming Star and Wild in the Country) which didn’t do as well at the box office so he went back to the cheesy musicals which set the tone for the rest of his movie career – until the last couple. It was while Elvis was in the army he started with the pills. Guralnick thinks the amphetamines affected Elvis’ acting – that he was more natural in King Creole (before the army) than in Wild in the Country (after the army). While making the movies, Elvis didn’t perform live from 1961 until 1969 (unless you count the NBC special in 1968). Also during this time, Elvis was mainly recording movie soundtracks in the 1960s because the movie soundtracks were selling better than the albums. The soundtracks for GI Blues and Blue Hawaii outsold Elvis is Back. The movies promoted the soundtracks, and the soundtracks promoted the movies. Are the fans to blame, rather than the Colonel, for Elvis’ bad career choices? I think it is the fans’ fault for almost all movie soundtracks and cheesy movie musicals in the 1960s. If the fans hadn’t bought the soundtracks and went to see the cheesy musicals, then Elvis and the Colonel would not have kept making them. Also if the fans had not accepted Elvis’ appearance in the late 1970s, maybe Elvis would have made an effort to get off the pills and get into shape since he did not listen to his family and friends. If Elvis’ mother had not died in 1958, would Elvis’ life and career had been different? Obviously Elvis was very depressed over his mother’s death, but I also think he was very guilty believing it was his fault she died because of his career and how much she worried about him and how she was unhappy with the riches of his career. So maybe Elvis wouldn’t have turned to pills to make him feel better and to cure the loneliness he felt after his mother died. Even though he had all his guys around him, after Glady’s death Elvis wanted the company of a woman so he could bare his soul and tell his innermost thoughts to. Elvis literally begged women to stay with him, even ones he had just met. It is truly sad every woman in Elvis’ life left him. First Dixie left him, then June, then his mother died, then Anita left, then Priscilla, then Linda and all the ones in between – and Ginger would have left too had he not died. Thank you, Deena, that was interesting. Thank you very much for reading and commenting. I’m glad you enjoyed it.